Thuy Tien Hotel ideally located in the center of commercial, financial and banking installations of Hanoi, and it takes only three minutes to Hanoi Opera House and five minutes working from the Hoan Kiem lake or Hanoi Old Quarter, the Thuy Tien Hotel is quite convenient for the needs of tourists and businessmen. 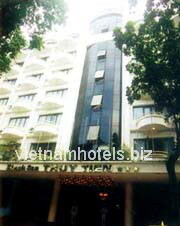 6 floor building three star hotel - Thuy Tien Hotel with 2 lifts offer you high quality accommodation but at economical prices. - Airport transfer: US$ 15/one way. - Conference Center: up to 120 people and small room up to 30 people.